Download the Leaky Loo Factsheet here! Between 5 and 8% of all toilets are leaking. Fixing one can halve a customer’s water bill, but most customers are unaware they have one. Around 400 million litres of water is estimated to leak from UK toilets every day, which is enough water to supply 2.8 million people – the populations of Edinburgh, Cardiff, Belfast, Manchester, Sheffield, Liverpool and Bristol combined. Fixing leaky loos could contribute around 10% of the additional water capacity needed to cope with an extreme drought by 2050. Studies suggest that 7/10 customers don’t know which button to press on their dual flush toilet. A leaking toilet wastes between 215 and 400 litres of clean drinking water on average every day. It’s like having 2 extra people using water in your home! Purchase a water efficient toilet. Dual flush toilets have a split flush button which gives the user the choice of how much water to use. 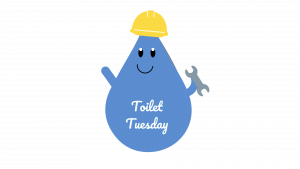 Dual flush toilets typically use 4-6 litres of water opposed to the old style flush systems which use a massive 13 litres per flush. Get a Cistern Displacement Device. A CDD is placed in the cistern to displace around 1 litre of water every time you flush. They are super easy to install. Installing a CDD can achieve savings of up to 5000 litres per year. They are available for FREE from most water companies. Try to avoid flushing away cotton ball or make up tissues, simply throwing them in a bin will cut down on the amount of water wasted with every flush. Check your toilet for leaks. Use a designated product or simply drip a few drops of food colouring into the water tank of your toilet. Don’t flush it for an hour. If after that time, you can see the colouring inside the toilet, you’ll know it is leaking.